Providing students with feedback on written work can, at times, feel like a burden. Dozens (perhaps even hundreds) of papers clutter your desk, and commenting on each is nearly impossible. Still, we know, both from our experiences and from research, that feedback is essential. John Hattie, Professor of Education and Director of the Melbourne Education Research Institute at the University of Melbourne, Australia, believes that feedback must be timely, relevant, and action-oriented. The good news, according to Hattie, is that "students want feedback just for them, just in time, and just helping nudge forward." To that end, he encourages us to "worry more about how students are receiving your feedback . . . than increasing how much you give." So how can we provide this kind of feedback -- the kind that students actually listen to, understand, and use -- in a timely manner? Before looking at specific technologies that can assist us in the process, let's first explore how other experts describe feedback as a key tool in the formative assessment process. Anyone involved in standardized testing knows two things: the results take entirely too long to get back and are completely impersonal, making that kind of feedback essentially irrelevant. In short, feedback needs to be personal, and it needs to be fast. 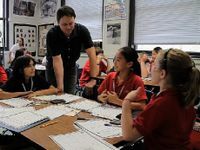 To that end, educators are beginning to refocus their attention on relevant, practical feedback for students during lessons or very soon after, rather than relying only on summative assessments. [F]eedback that the teacher provides to students is also an essential resource so the students can take active steps to advance their own learning. In reality, the feedback to students can be understood as instructional action. Additionally, NCTE's Assessment Task Force, in their report Formative Assessment That Truly Informs Instruction, makes the case that good formative assessment, among other key factors, "includes feedback that is non-evaluative, specific, timely, and related to the learning goals, and that provides opportunities for the student to revise and improve work products and deepen understandings." 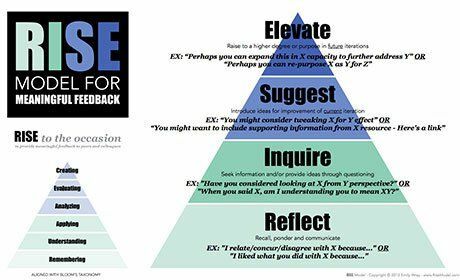 One last idea that I have encountered in the past few months -- and that I hope can help shift your thinking on how and why to give feedback -- is the RISE feedback model. Introduced by Emily Wray, the RISE model encourages us to provide feedback that is not simply informative, but moves students toward improvement. Thus, seeing feedback as a teaching opportunity can help us shift our perspective from correction to collaboration, from merely fixing students' work to moving students forward in their learning. Here, there are many technologies that can help us in the process of providing feedback. The tools available for providing feedback continue to multiply. I've heard how, back in the day, college professors would record their comments on audiotape, trading cassettes with students when handing back papers. We've moved forward a bit since then. First, there are a number of tech tools that enable timely, relevant, and action-oriented feedback. Many of them -- from Microsoft Word to Google Docs to Wikispaces -- allow us to insert comments directly in the margins of students' writing. And while voice-to-text tools like Dictanote (Chrome Extension) and Dragon Dictation (App) can help speed this process up a bit, some colleagues may be looking for other methods. For those of us interested in providing audio feedback, MS Word allows audio comments to be embedded within a document. And the web, of course, has provided us with new tools to provide voice comments, such as Kaizena, which allows us to embed audio comments in a Google Doc, and Voxer, which is described as a tool that combines a walkie-talkie with voice mail so that "you can hear messages as people speak, or listen later if you are unavailable." There are visual tools for providing feedback, too. 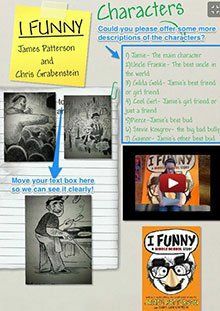 Skitch (by Evernote) and Snagit (by TechSmith) allow users to easily capture and annotate screenshots. This ability can work for students -- as they can capture images of their work and reflect on it -- as well as for teachers providing feedback. For instance, when using a visual tool such as Glogster, it is impossible to embed comments like we could in a Google Doc. Therefore, as shown in this screencapture I made with Skitch, we can provide students with focused feedback on visual texts that do not innately support annotation. Taking it up a notch, we can offer dynamic feedback via screencasting using tools like Jing or Explain Everything. I have often told my students, "You are only as good a writer as you are a responder." That is, you learn how to write by providing feedback to other writers. Given this perspective, my hope is that you are willing to share your feedback with students generously, all the while modeling for them the kinds of feedback that you would want them to give one another. 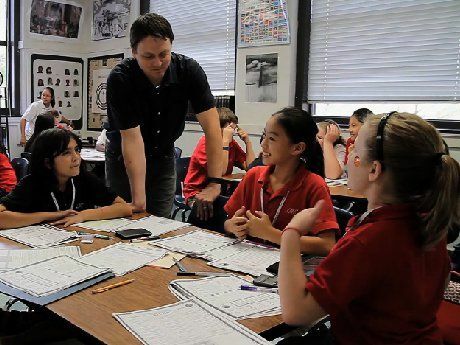 In so doing, we can create a culture of feedback that, ultimately, feeds our students' interests and "nudges" passions forward, making those piles of papers on our desks feel a bit more manageable as we engage students through authentic response.